AWC-SB prides itself on accomplished members. AWC-SB is the premiere organization for communication professionals in the greater Santa Barbara area whose mission is to provide access to communication role models. The organization empowers women in the workplace by hosting motivational events that stimulate change, spark new ideas, and encourage collaboration between its members. AWC-SB hosted their annual Women of Achievement Awards Luncheon, Money Matters: Journalism, Justice, and Empowerment, on Wednesday, June 5 at the Montecito Country Club. 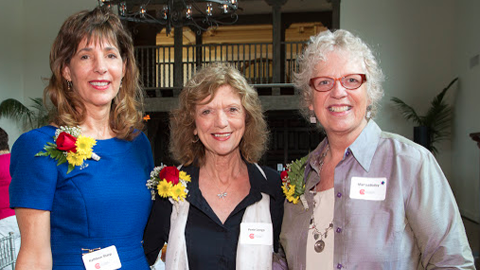 A sold-out crowd of 150 came to honor Kathleen Sharp, author of Blood Medicine and Mr. & Mrs. Hollywood, and Marsha Bailey, Founder & CEO at Women’s Economic Ventures. 2013 Women of Achievement Awards from Ninety Degrees Media on Vimeo. Mary Olsen, General Manager of KCLU radio, charmed attendees as AWC-SB Emcee. She explained how she overheard one of her children explaining to the other about where she was going. “Mom has this thing today…something about saving the world.” Laughter erupted while attendees appreciated the simple way a child could describe what had not been immediately obvious: That the women at the event place among the best and brightest, and the women they honored stand among the extraordinary. Susan Rose, previous Santa Barbara County Supervisor and Vice-Chair of the Santa Barbara Human Rights Watch Committee, introduced AWC-SB’s first Woman of Achievement, Marsha Bailey. Marsha Bailey is the Founder and CEO of Women’s Economic Ventures (WEV). With over 23 years of experience as a small business development practitioner, Marsha continues to provide exceptional training, consulting, and capital to growing businesses throughout California’s Central Coast. During her acceptance speech Marsha stressed the importance of communicating our desires. “If we can’t convince women they can do anything [through AWC-SB and our efforts in the communications field], then we fail…in a democracy, your voice cannot be taken away, you can only give it away.” For her remarkable work at WEV aiding women in business, AWC-SB applauds Marsha Bailey as one of this year’s Women of Achievement recipients. Concluding this Spring’s annual event, Lois Phillips, PhD, founding President of AWC-SB, awarded esteemed professor, Dr. Anna Laura Jansma, the first ever Lois Phillips Founders Award. With this award, AWC-SB acknowledged Dr. Anna Laura for her exemplary contributions to the development of the local chapter and for her passions in connecting her students with the association’s professional members. Better known by her students as Dr. J, Anna Laura has a keen sense for success and collaboration. Through her authentic teaching skills, she has helped cultivate many of the productive relationships between students and professionals that have improved this city’s affluence. AWC-SB is honored to have awarded these astounding professional women for their contributions to the field of communication. This entry was posted in Past Events on July 31, 2013 by Lisa.